Sometimes it becomes so difficult to identify certain corals. So, what is this Cyphastrea or Stylocoeniella or Goniopora. I want to know the exact same thing for some time now. There are so many variations and color out there that identifying becomes very difficult. What is shown here when retracted is a Meteor Shower, half extended becomes Stylocoeniella and when fully extended seems like Goniopora. 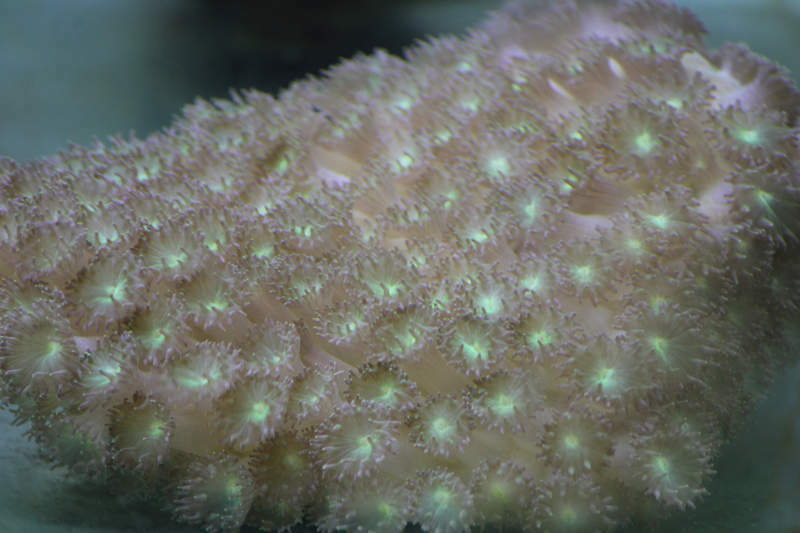 The base is white the polyps are green when extended the polyps are wavy seems Goniopora. Retracted at night and under blue light seems Cyphastrea, fully extended under white and medium lighting. White base is like a cover on the rock. Responsive to touch and immediately retract back. When feed the extended polys would grasp and close the flower completely. The base white would bloat up like a cake. In the local market these are referred as polyps, but they are definitely not. They seem more like LPS as they are giving all kinds of sing to be associated with. Finding the correct coral is far more difficult compared to fish online. Cyphastrea or Stylocoeniella or Goniopora is still not clear checking all references and forums. So, if you are aware and know about this coral leave your comment in the below section.